On January 2nd 1864, Brig. Genl. James Barnes ordered Company “B” of the 1st Regiment of United States Colored Troops commanded by Capt. Henry S. Perkins to be detailed for duty at Fort Norfolk relieving Company “A” 148th Regiment of New York Volunteers Commanded by Capt. Daley. Capt. Daley and Company “A” 148th N. Y. Volunteers upon being relieved turned over all books papers and other property belonging to the post and then with his command rejoined his Regiment. On January 13th 1864, Brig. Genl. James Barnes ordered Companies “H” & “L” Massachusetts Heavy Artillery to be detailed for duty at Fort Norfolk relieving Company “B” of the 1st Regiment of United States Colored Troops commanded by Capt. Henry S. Perkins. Capt. Perkins and Company “B” of the 1st Regiment of United States Colored Troops upon being relieved rejoined his Regiment. 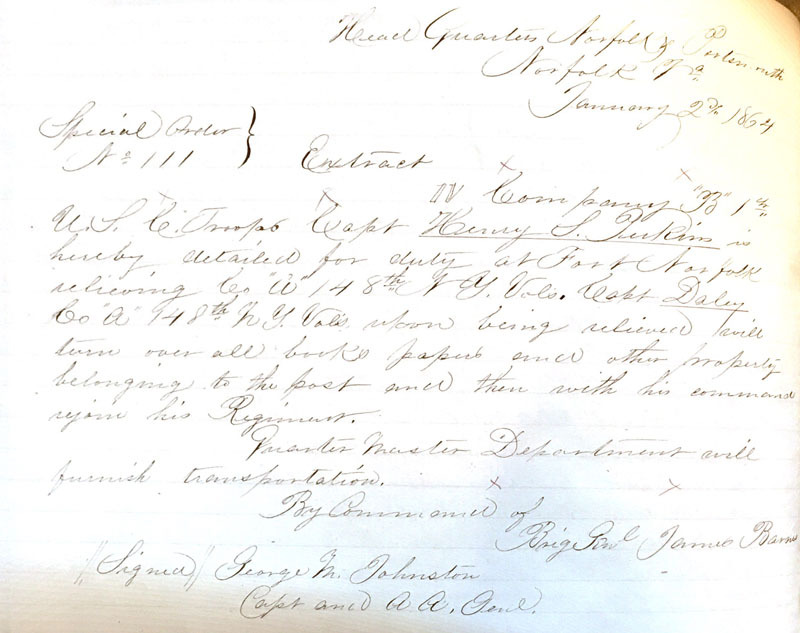 In 1991, graffiti was found on the walls of the old officers quarters indicating that the crew and passengers of a rebel blockade runner were incarcerated there for a few weeks during March of 1864 (Knepler 1991). According to an unprovenienced nineteenth century files, Fort Norfolk was used by the Army "as a prison for persons sentenced to labor with ball & chain for communicating with rebels beyond the lines of the army and for other violations of the Martial Law then prevailing" (RAGO, "Citations and references to Fort Norfolk"). Fort Norfolk was turned over to the Navy by the end of March 1864. Major-General Benj. F. Butler wrote Rear-Admiral S. P. Lee on June 30, 1864 "It was agreed, as I understood, between the Navy Department, yourself, and the major-general commanding, that upon the turning over of Fort Norfolk to you for a naval magazine that the building occupied as a naval store-house on the wharf at Fortress Monroe should be vacated for the use of the army, and to prevent the danger from the ordnance remaining therein. Three months have now elapsed since Fort Norfolk was put in possession of the navy for that purpose, and I am informed that the ordnance store-house is not vacated. May I request that an order be issued that at may be done at once. If the navy is not supplied with transportation for that purpose upon intimation to me I will see that the store-house is immediately cleared."